LONDON--(BUSINESS WIRE)-- Capri Holdings Limited (NYSE:CPRI), a global fashion luxury group, today announced its financial results for the third quarter of fiscal 2019 ended December 29, 2018. John D. Idol, the Company’s Chairman and Chief Executive Officer, said, “We are extremely pleased to have recently renamed our Company Capri Holdings Limited and completed the acquisition of Versace. In the quarter, Jimmy Choo delivered strong performance, as we continued to execute on our accelerated growth plans. In Michael Kors, we remain focused on executing our Runway 2020 strategic initiatives and expect our efforts will return the brand to growth next year. For full year fiscal 2019, our luxury group is expected to deliver both double digit revenue and adjusted earnings per share growth. Taken together, we believe our three iconic, founder-led fashion brands position Capri Holdings to accelerate revenue to $8 billion dollars and deliver multiple years of earnings growth." The Company’s results are reported in this press release in accordance with accounting principles generally accepted in the United States (“U.S. GAAP”) and on an adjusted, non-GAAP basis. A reconciliation of GAAP to non-GAAP financial information is provided at the end of this press release. Total revenue of $1.44 billion was approximately flat compared to last year, including an incremental month of Jimmy Choo revenue of $39.3 million. On a constant currency basis, total revenue increased 1.1%. Gross profit was $873.2 million and gross margin was 60.7%, compared to $884.0 million and 61.4% in the prior year. Adjusted gross profit was $874.1 million and adjusted gross margin was 60.8%, compared to $885.6 million and 61.5% in the prior year. Income from operations was $290.0 million and operating margin was 20.2% compared to $313.5 million and 21.8% in the prior year. Adjusted income from operations was $316.5 million and operating margin was 22.0%, compared to $345.7 million and 24.0% in the prior year. Net income was $199.6 million, or $1.33 per diluted share compared to $219.4 million, or $1.42 per diluted share in the prior year. Adjusted net income was $264.7 million, or $1.76 per diluted share, compared to $273.4 million or $1.77 per diluted share in the prior year. Michael Kors Retail revenue of $838.0 million decreased 1.0% compared to the prior year. Comparable store sales decreased 2.4%, which was in line with expectations. On a constant currency basis, comparable store sales decreased 1.0%. Michael Kors Retail operating income was $149.9 million and operating margin was 17.9%, compared to $180.4 million and 21.3% in the prior year. Adjusted operating income was $162.5 million while adjusted operating margin was 19.4%, compared to $194.0 million and 22.9% in the prior year. Michael Kors Wholesale revenue declined 8.3% to $394.9 million compared to the prior year. Michael Kors Wholesale operating income was $108.6 million and operating margin was 27.5%, compared to $100.5 million and 23.3% in the prior year. On an adjusted basis operating income was $111.2 million while adjusted operating margin was 28.2% compared to 107.8 million and 25.0% in the prior year. Michael Kors Licensing revenue decreased 9.9% to $43.5 million compared to the prior year. Michael Kors Licensing operating income was $26.0 million and operating margin was 59.8%, compared to $26.9 million and 55.7% in the prior year. On an adjusted basis operating income was $26.4 million and operating margin was 60.7%, compared to $28.2 million and 58.4% in the prior year. Inventory for the Michael Kors brand at December 29, 2018 was $606.2 million, an 8.2% increase as compared to the prior year. Jimmy Choo revenue was $161.6 million. The Company acquired Jimmy Choo on November 1, 2017, and compared to Jimmy Choo stand-alone results from the prior year, revenue increased mid single digits. Jimmy Choo operating income was $5.5 million and adjusted operating income was $16.4 million. Inventory for the Jimmy Choo brand at December 29, 2018 was $158.5 million, a 35.3% increase as compared to the prior year. During the third quarter, the Company repurchased approximately 2.1 million of the Company's ordinary shares for approximately $100.0 million in open market transactions. As of December 31, 2018 the remaining availability under the Company’s share repurchase program was $442.2 million. The following guidance is provided on an adjusted, non-GAAP basis. Fiscal 2019 guidance includes projected Versace results subsequent to the closing of the acquisition on December 31, 2018. Guidance includes Versace results for two months, as the Company will report Versace on a one month lag, and includes a full three months of interest costs related to the acquisition. For the full year, the Company expects total revenue to be approximately $5.22 billion. Michael Kors revenue is expected to be approximately $4.51 billion, including a low single digit comparable store sales decline. Jimmy Choo revenue is now expected to be approximately $580 million, a slight reduction from prior guidance reflecting an unfavorable foreign currency impact. Versace revenue is expected to be approximately $130 million. The Company now expects an operating margin of approximately 17.3%, reflecting brand operating margins of approximately 19.5% for Michael Kors, 4.8% for Jimmy Choo and slightly negative for Versace. 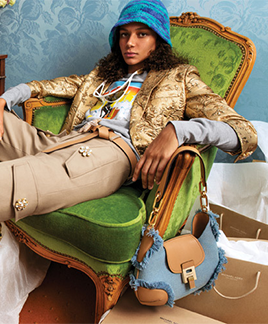 The Company is updating its full year earnings per share guidance to be in a range of $4.90 to $4.95, including $0.15 of dilution from the Versace acquisition, partly offset by a $0.05 increase to previous guidance for the pre-acquisition business, reflecting third quarter results. This guidance continues to include dilution from Jimmy Choo of $0.05 to flat. Earnings per share guidance assumes approximately 152 million weighted average diluted shares outstanding, including the 2.4 million shares issued to the Versace family in connection with the acquisition and an effective tax rate of approximately 13.0%. For the fiscal fourth quarter of 2019, the Company expects total revenue of approximately $1.33 billion. Michael Kors revenue is expected to be approximately $1.07 billion, including a low single digit decline in reported comparable sales close to the higher end of the range. Michael Kors constant currency comparable sales are expected to decline close to the low end of the low single digits range. Jimmy Choo revenue is expected to be approximately $130 million, including a comparable sales increase in the low single digits on a reported basis and mid single digits on a constant currency basis. Versace revenue is expected to be approximately $130 million. Operating margin is expected to be approximately 10.3%, reflecting brand operating margins of approximately 13.6% for Michael Kors, negative 4.5% for Jimmy Choo and slightly negative for Versace. Diluted earnings per share are expected to be in the range of $0.56 to $0.61, which includes approximately $0.15 of dilution from Versace. Earnings per share guidance assumes approximately 153 million weighted average diluted shares outstanding and an effective tax rate of approximately 20.0%. While the Company normally provides long term expectations at our Investor Day, given the recent acquisition of Versace the Company believes it is important to update its expectations for Capri Holdings and has added a table to this earnings release outlining the major components of its anticipated growth. For fiscal 2020, the Company expects total revenue to be approximately $6.1 billion, including approximately $900 million for Versace, $650 million for Jimmy Choo and $4.55 billion for Michael Kors. The Company expects an operating margin of approximately 15.5%. Diluted earnings per share are expected to be approximately $4.95. For Capri Holdings, beyond Fiscal 2020, the Company expects to deliver accelerated revenue and earnings per share growth. The Company believes these results will be driven by revenue growth for Versace, Jimmy Choo and Michael Kors, as well as expanded margins from Versace and Jimmy Choo, and looks forward to providing additional guidance and long term expectations at its Investor Day in June. A conference call to discuss third quarter results is scheduled for today, February 6, 2019 at 8:30 a.m. ET. A live webcast of the conference call will be available on the Company’s website, www.capriholdings.com. In addition, a replay will be available shortly after the conclusion of the call and remain available until February 13, 2019. To access the telephone replay, listeners should dial 1-844-512-2921 or 1-412-317-6671 for international callers. The access code for the replay is 4719600. A replay of the webcast will also be available within two hours of the conclusion of the call and will remain on the website for 90 days. Constant currency effects are non-GAAP financial measures, which are provided to supplement our reported operating results to facilitate comparisons of our operating results and trends in our business, excluding the effects of foreign currency rate fluctuations. Because we are a global company, foreign currency exchange rates may have a significant effect on our reported results. We calculate constant currency measures and the related foreign currency impacts by translating the current year’s reported amounts into comparable amounts using prior year’s foreign exchange rates for each currency. All constant currency performance measures discussed below should be considered a supplement to and not in lieu of our operating performance measures calculated in accordance with U.S. GAAP. Additionally, this earnings release includes certain non-GAAP financial measures relating to certain one-time costs associated with the Jimmy Choo acquisition and the Versace acquisition and restructuring and non-cash impairment charges primarily associated with underperforming retail stores. The Company uses non-GAAP financial measures, among other things, to evaluate its operating performance and in order to represent the manner in which the Company conducts and views its business. The Company believes that excluding non-recurring items helps its management and investors compare operating performance based on its ongoing operations. While the Company considers the non-GAAP measures to be useful supplemental measures in analyzing its results, they are not intended to replace, nor act as a substitute for, any amounts presented in its consolidated financial statements prepared in conformity with U.S. GAAP and may be different from non-GAAP measures reported by other companies. (1) Includes store closure costs recorded in connection with the Retail Fleet Optimization Plan and other restructuring initiatives, and transaction and transition costs recorded in connection with the acquisitions of Jimmy Choo Group Limited and Gianni Versace S.p.A.
(1) Includes store closure costs recorded in connection with the Michael Kors Retail Fleet Optimization Plan, as well as transaction and transition costs recorded in connection with the acquisition of Jimmy Choo Group Limited.